The spellbinding Spiti Valley, located in Himachal Pradesh in India, is often proclaimed by those who see it to be world within a world. With an average height of around 12,500 feet above sea level, it consists of stark high-altitude alpine land. This is scattered with small villages and monasteries, and enclosed by soaring peaks crowned with snow. Spiti is bordered by Ladakh in the north, Tibet to the east, Kinnaur to the south east, and the Kullu Valley to the south. It shares the same religion as Tibet -- Tibetan Buddhism. The majority of people who inhabit the area are farmers who produce crops of barely, wheat, and peas. They rise early every morning to attend to their crops. Only one crop per year is possible, due to the extreme weather. Spiti receives heavy snow fall during the winter. This results in many villages being completely cut off from the rest of the valley. The ideal time to visit Spiti is from May to October. During this time, the weather is sunny and pleasant. Spiti is also the most accessible during these months. Due to Spiti's high altitude, special care must be taken to avoid altitude sickness. You should allow a couple of days to acclimatize before heading up to the higher villages in Spiti. In addition, you should drink plenty of water to avoid dehydration. Scroll through the following pages of this Spiti travel guide to plan your trip to amazing Spiti. Your experience is sure to be a memorable one, as Spiti is such a unique travel destination. Spiti isn't that far away from the rest of India in terms of distance. Yet, due to the condition of the roads, it's not possible to get to Spiti quickly or easily. Even though the drive to Spiti is long, it's far from boring. The ever changing scenery is so stunning, it's unlikely that you'll be tempted to take even the shortest of naps. There are two routes leading to Spiti. These are from Manali, and from Shimla. Manali to Spiti -- the distance from Manali to Spiti is a little over 200 kilometers (125 miles). It can be covered in eight to 12 hours, depending on whether you go by bus or by jeep, and the condition of the road around Rohtang Pass near Manali. It's best to leave Manali as early in the morning as possible (before 6 a.m.), to avoid major traffic congestion and delays at Rohtang Pass. Rohtang Pass and Kunzum Pass are covered in snow for most of the year, with the roads only open from May to October. Therefore, it's only possible to travel from Manali to Spiti during these months. (Note: the road has been opening in late June or early July as opposed to May in recent years). Nevertheless, this route remains the most straightforward way of getting to Spiti. It's also very popular with motorcycle enthusiasts. There's a police checkpoint at Losar village, at the entrance to the Spiti Valley, where foreigners are required to produce their passport and register their details. To get an idea of what to expect along the way from Manali to Spiti, check out this Manali to Spiti Photo Gallery. Shimla to Spiti (via Rekong Peo in Kinnaur) -- the distance from Shimla to Spiti is around 420 kilometers (260 miles). It can be covered in about 20 hours by bus or 16 hours by jeep along the Hindustan Tibet Road. The journey is arduous and best broken up by a stop in Rekong Peo. If you take this route, be aware that foreigners must get an Inner Line permit from the District Collectors office in either Shimla or Rekong Peo. The permits allow travel in the restricted area from Rekong Peo to Tabo. According to the rules, such permits are only issued to groups of two or more people traveling together. However, the office at Rekong Peo is less strict about enforcing this (and less busy too). Both routes have their advantages or disadvantages. Although it's significantly longer, a major benefit of the Shimla to Spiti route is its gradual ascent. This allows for better acclimatization and reduced risk of altitude sickness. The route is also open all year round, except for when there's heavy snowfall in Kinnaur and really inclement weather. Plus, you'll be able to avoid the inconvenience of having to go through Rohtang Pass. The dramatic and at times hair-raising Hindustan Tibet Road is an adventure in itself. Foreigners may not want waste time (two to four hours) getting an Inner Line Permit for this route though. If you have enough time, you can do a complete circuit -- arriving at Spiti by one route and departing by another. If you don't have your own vehicle, taking a taxi is the easiest way of getting to Spiti. However, it's expensive! You can expect to pay 8,000-10,000 rupees for a private jeep taxi from Manali (this price will reduce to about 3,500 rupees per day if you book the vehicle for the whole trip including return), or about 1,000-2,000 rupees per person in a shared taxi depending on the size of the vehicle. Buses are cheaper and cost about 400 rupees per person. There are two Himachal Pradesh Road Transport Corporation services a day from Manali to Kaza, and they depart really early in the morning (5 a.m. and 5.30 a.m). Expect to pay more from Shimla to Spiti. Bus services from Shimla run to Reckong Peo, and then from Reckong Peo to Kaza. You can choose to depart Shimla either early in the morning or in the evening. Spiti has a total population of around 10,500 people. These people inhabit villages spread over three levels of altitude -- lower, middle, and upper -- with Kaza being the region's main administrative center. Kaza, with an altitude of 12,500 feet (3,800 meters) above sea level is in the upper region, and is popularly used as a base by travelers. 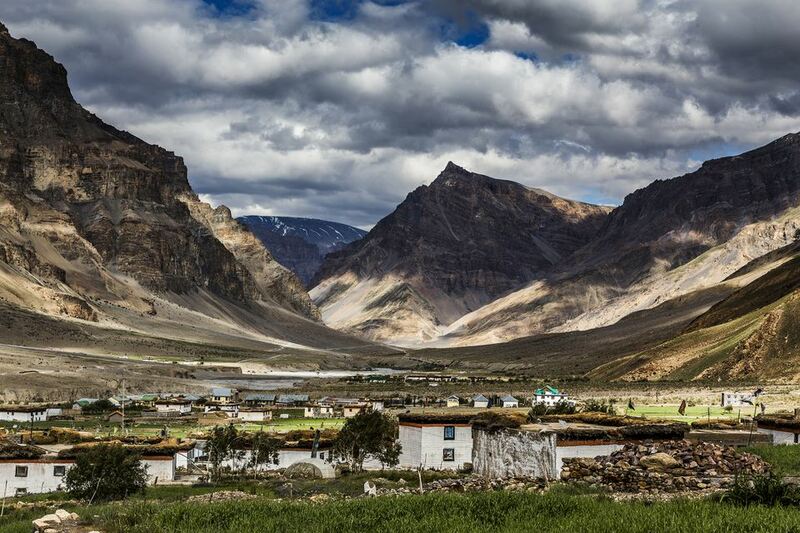 These spectacular photos of the Spiti Valley show its stark beauty. A trip to Spiti wouldn't be complete without exploring the villages, and discovering exactly what it’s like to inhabit such a remote, high altitude environment. The harsh winters force residents to stockpile food and remain housebound for months at a time. During this period, they occupy themselves by making handicrafts. Kibber -- once the world's highest village with a motorable road and electricity, it's located not far from Kaza at 14,200 feet (4,270 meters) above sea level. It's popular with travelers and has a few laid-back guest houses. Komic -- Asia's highest village with Spiti's highest monastery at an altitude of 15,049 feet (4,587 meters) above sea level. Langza -- known for its fossils, is a small village with a huge and colorful statue of Lord Buddha presiding over it. It has an altitude of 14,500 feet (4,400 meters) above sea level. Demul -- is a lively and alluring village, with a captivating vista at 14,300 feet (4,360 meters) about sea level. It's an excellent place to spend a day or two at a homestay. It's also becoming Spiti's model sustainable village, with solar power and waste management. Lhalung -- located at a height of 12,000 feet (3,660 meters) above sea level, is rich in diverse flora including Seabuckthorn trees. Dhankar -- is a large and remarkable village, that was once the capital of Spiti. Located 12,760 feet (3,890 meters) about sea level, the village is an unforgettable sight as it balances precariously on the edge of the cliff face. Attractions include the Dhankhar monastery, ruined fort, lake, and awe inspiring views. (Foreigners require a permit for this area, obtainable in Kaza). Hikkim -- has the world's highest post office. Giu -- has a 500 year-old mummy. There are five main Tibetan Buddhist monasteries in Spiti -- Ki, Komic, Dhankar, Kungri (in the Pin Valley) and Tabo. Visiting these monasteries is a fascinating experience. Inside, they're filled with mystical dimly lit rooms and ancient treasures. You’ll be able to unearth well preserved artwork, scriptures, and statutes as you delve into the Tibetan Buddhist religion. The monasteries have significant influence over the lives of Spiti’s inhabitants. Tradition requires that families donate their second eldest son to the monastery in their area, or pay a hefty (and usually unaffordable) fine. Ki Monastery -- located not far from Kaza, Ki Gompa is the largest and most accessible monastery in Spiti. It's full of narrow stairways, box like rooms, and courtyards. The monastery rewards those who enter with a magnificent view over the valley. Another highlight is seeing the bedroom that the Dalai Lama slept in during his visit to the monastery. Don’t miss the annual three day Chaam festival, featuring masked dancing monks, that's held at the monastery in late July. Tabo Monastery -- founded in 996 AD, Tabo is the oldest monastery and has an important role to play. The Dalai Lama will retire from his duties there. Although Tabo is located two hours from Kaza, it's well worth a visit. There are nine temples in the complex, as well assembly hall, captivating statues, incredibly beautiful art work, and a public library. You'll also find meditation caves nearby. (Foreigners require a permit for this area, obtainable in Kaza). 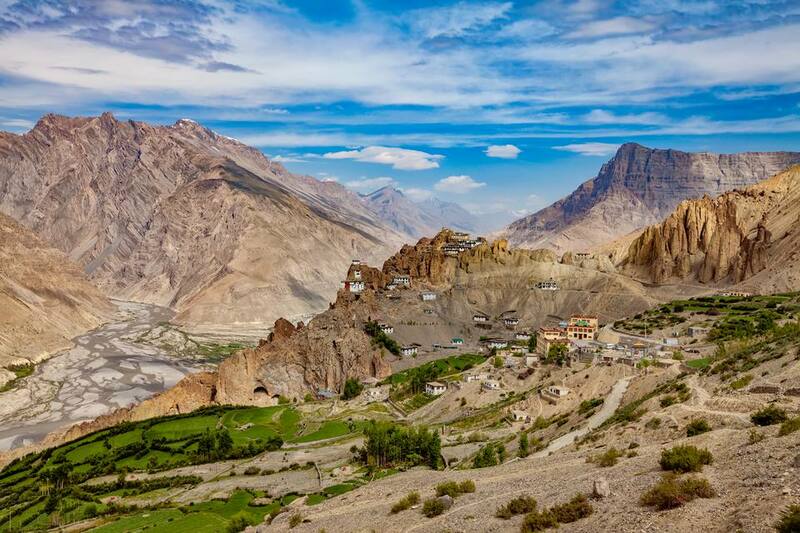 Dhankar Monastery -- it's the spectacular rocky setting that makes this monastery special. The sculptures and frescoes are also interesting. (Foreigners require a permit for this area, obtainable in Kaza). Komic Monastery -- this small monastery is perched on a desolate hilltop overlooking Asia's highest village. To make the most of your trip to Spiti, you'll want to get out and about, and explore its essence. There are a wide range of options for immersing yourself in the attractions that Spiti has to offer. Trekking -- adventure enthusiasts love trekking in Spiti. Opportunities are almost endless. Some well-known treks are Pin-Parvati, Parang- La, and Pin-Bhaba. Village to village treks are also popular, such as the one from Kaza to Demul via Komic. It’s possible to visit less frequented areas as well. Yak Safari -- if you're not up for trekking (which does require excellent fitness and stamina!) a yak safari is a perfect alternative. Each village family usually owns one yak, which they let roam freely during the summer. Your safari will take place on one of these yaks, fetched by the village boys. A yak safari from Komic to Demul villages takes around four hours, including a stop for lunch. Cultural Performances -- Demul and Lhalung villages are renowned for their cultural shows, featuring traditionally dressed dancers and live music. Tracking Endangered Wildlife -- track India's exotic and endangered Snow Leopard and Himalayan Wolf in the Pin Valley National Park and Kibber Wildlife Sanctuary. Mountain Biking -- traverse little known valleys and plateaus on a mountain bike. White Water Rafting -- the Pin and Spiti rivers offer some great white water rafting opportunities. Excursions to villages and monasteries. All these activities can be arranged by Ecosphere Spiti, a highly recommended and award winning organization, based in Kaza. Ecosphere has a committed focus on conservation, responsible tourism, and sustainable development. Adrenaline junkies who want to experience everything should check out Ecosphere's 12 Day Classic Spiti Adventure trip. It combines trekking, biking, yak safari, and whitewater rafting. Departures run from June to October. You'll find a range of comfortable hotels, guesthouses, and backpacker hostels in Kaza and Kibber. In Kaza, expect to pay around 1,000 rupees upwards per night for a clean room, with western toilet and 24 hour hot water. Hotel Deyzor is undoubtedly the most popular place to stay, with rooms from 1,400 rupees per night. The next best option is Sakya Abode (in the new part of town). Kaza now has a Zostel hostel and notably it's Asia's highest backpacker hostel. There are dorms, tents, and private rooms. The Traveller's Shed is another new budget option, with dedicated service center for bikers. Accommodations in Kibber (where backpackers hangout) are cheaper, and more basic. There a number of guest houses to choose from. The best place is Norling Guest House at the entrance to the village, with rooms from 1,200 rupees per night. They offer tours as well as accommodations with balconies. Plus, beer on request. One of the most fascinating things that you can do in Spiti is to stay in one of the villages with a local family. The rustic homestays are are all very similar in terms of facilities, although each village differs in its nature, and cost around 3,000 rupees per night including meals. Be prepared to use traditional composting toilets, which are not much more than a hole in the ground. While staying in Spiti’s villages, you’ll be able to dine on delicious home made local cuisine, often consisting of momos (vegetable dumplings), thukpa and thenthuk (hearty noodle soups). Ecosphere Spiti arranges homestay accommodations for travelers.